Released on Earth Day 2018, the 2018 AEG Sustainability Report, available for download on the company’s website, outlines the company’s progress toward its set of 2020 Environmental Goals that are based on performance metrics collected from its worldwide venues, festivals and offices. 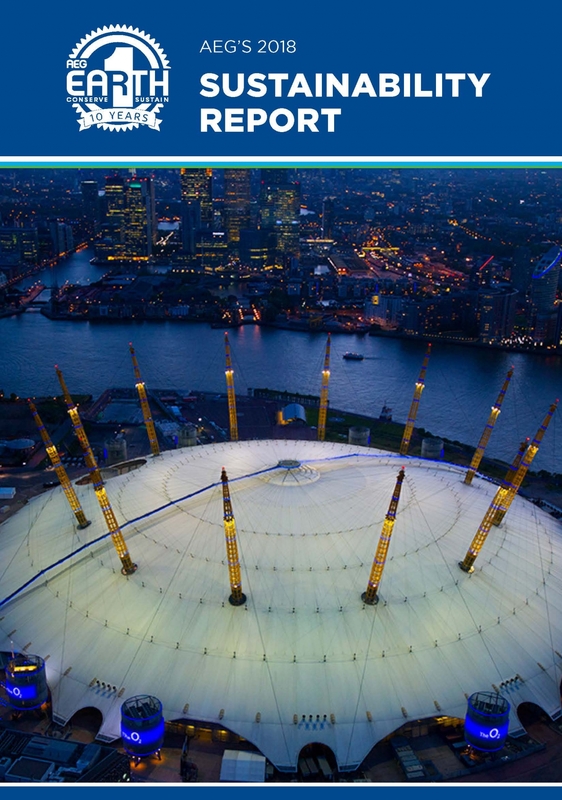 Additionally, the report features “Anniversary Spotlights” on three of AEG’s most iconic properties – L.A. LIVE, The O2 and Mercedes-Benz Arena in Berlin – which drove transformation and growth in their respective cities by revitalizing blighted urban areas into thriving sports and entertainment districts. To view and download the 2018 AEG Sustainability report, click here. Headquartered in Los Angeles, California, AEG is the world’s leading sports and live entertainment company. With offices on five continents, AEG operates in the following business segments: AEG Facilities, which is affiliated with or owns, manages or consults with more than 150 preeminent arenas, stadiums, theaters, clubs and convention centers around the world including The O2 Arena, the Sprint Center and the Mercedes-Benz Arenas; AEG Presents, which is dedicated to all aspects of live contemporary music performances, including producing and promoting global and regional concert tours, music and special events and world-renowned festivals; AEG Real Estate, which develops world-class venues, as well as major sports and entertainment districts like STAPLES Center and L.A. LIVE; AEG Sports, which is the world’s largest operator of sports franchises and high-profile sporting events; and AEG Global Partnerships, which oversees worldwide sales and servicing of sponsorships including naming rights, premium seating and other strategic partnerships. Through its worldwide network of venues, portfolio of powerful sports and music brands, AXS.com ticketing platform, AXS cable television channel and its integrated entertainment districts, AEG entertains more than 100 million guests annually. More information about AEG can be found at www.aegworldwide.com.